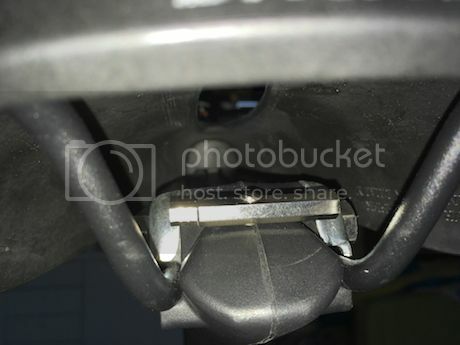 Just my 2 cents about the issue with saddle that don't fit on strida due to proximity of the plastic molding. I bought one few months ago but I am just testing it now as weather is now a bit better in this part of Europe. It works fine for me. I have found that it increases the range of adjustment and at the same time provide some extra cautionning. This topic is old, but maybe someone will use this info. 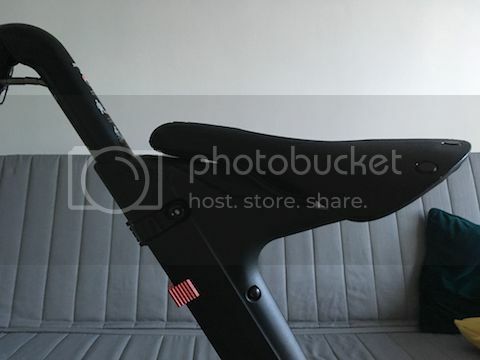 I've just installed "Brooks Cambium C19 Carved All Weather" on my Evo 18. if this saddle would be 1 mm lower (mounting point to front rack) it would not be possible to install it. There is a little less "room" to adjust than on "stock" saddle (saddle moves to front and rear but in a very small range), but there was no issues during installation (I did not see C17, but on the pictures it looks "lower" than C19, so I think that it will be difficult to install it on strida). Be aware that the front of the saddle is directed upwards (similar to stock or Gyes 08), which makes this saddle "feels" differently than on "regular" bike. Another thing is that because of strida construction ("shape"), there is less space underneath the saddle and this saddle must have room to bend. This is because plastic mounting on strida is higher than on regular bike (I mean extra plastic over the fastening screw). Maybe someone who weight more than me will suffer. I have only a few millimeters air to plastic when I ride on it. I made on it just about ~50km in total (each time ~45 minutes non stop in the saddle, 5 days a week), so I can not tell much about it, but my first impressions are rather positive... boy, this saddle is really hard but I have no issues with my sitbones (I am skinny, weight 65 kg). AH search is my friend. I would try it if it wasnt so expensive, maybe a bike shop will try and fit one for me. 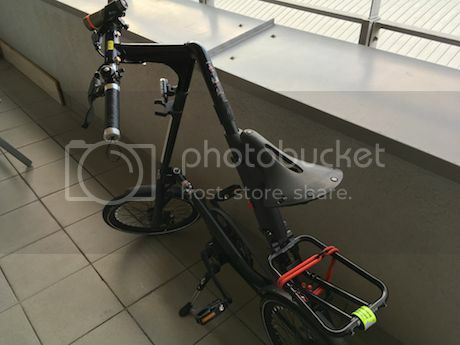 Brooks Cambium C17/C17s on a Strida? I already have the new saddle (Brooks B67 - honey) fitted 1 week ago and my first impressions are positive. Just did about 50 kms and the broke-in process is only just beginning but everything indicates that the choice of this saddle was correct. "I increased the length of the springs because I found the Brooks-saddle not exactly horizontal! 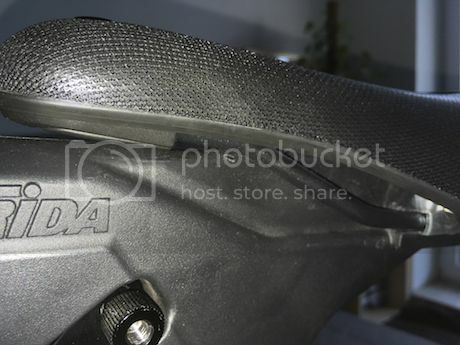 ...and the spring itself was NOT expanded, but I used a rubber silentblock to lengthen it"
From what I read on the forums, on conventional bikes, Brooks saddles need to be adjusted to point slightly upwards to avoid sliding, while with a Gyes saddle this is not the case. 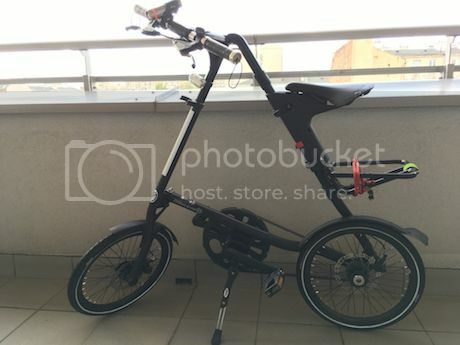 So if a Brooks already points upwards on a Strida, it would even be worse with a Gyes apparently :? I increased the length of the springs because I found the Brooks-saddle not exactly horizontal! 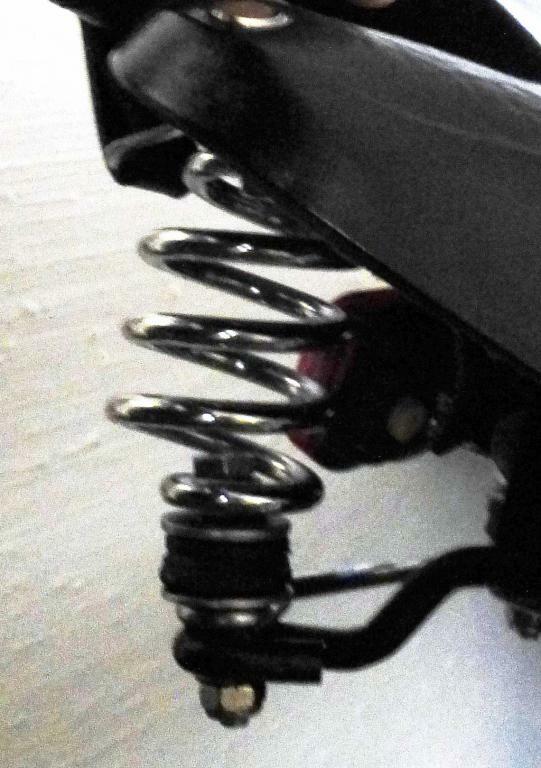 ...and the spring itself was NOT expanded, but I used a rubber silentblock to lengthen it. Very nice study Bietrume, and about horizontality when the saddle is mounted? Both the original saddle and my Selle Royal have the front highter than the back and this creates a great pression in the worst part of our anatomy! Why did you increase the length of the spring? Was the spring travel too short on big bumps? Does the spring deform just that easily? I have a black Brooks Finesse on another bike and the black color leaches out on my clothes! That is why I got a B67 Select , the light tan color should leave less of a color stain on my clothes. I have no experience with Brook's brown leather. Something to consider researching when buying any color dyed leather product.